- Manufactured from pure electrolytic copper. - Copper lugs & cable terminals from 2. 5 to 1000 mm2 with different stud hole sizes as required. - Lead free electro tin plated to prevent atmospheric corrosion. - Cable lugs are fully annealed to guarantee optimum ductility. - UL, CUL certified product. Waterproof pre-insulated hexagonal compression lugs. 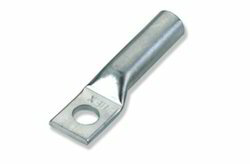 The lugs are suitable for insulated stranded Al. conductors. The lugs conforms to CENELEC prEN 50483-4 class 1, NFC 33021 and ESI 43-14.